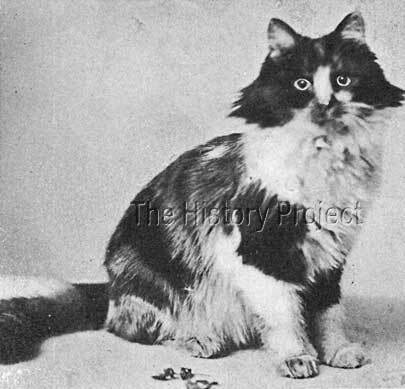 Bi-colour and Parti-coloured longhairs have been part of the cat show scene from the very earliest of times, as is evidenced by those which were drawn by Harrison Weir himself, from exhibits entered in the very first Crystal Palace Show of July, 1871. 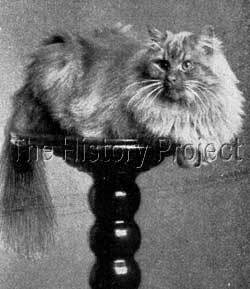 Despite this, they did not prosper in England as they probably should have, as aside from Tabbies and Silvers (Chinchilla's) the majority of English breeders were focused almost solely on the facets of depth, purity and even-ness of colour, of clearing the coat of barring, and ensuring that the self-coloured cat was the best it could be. 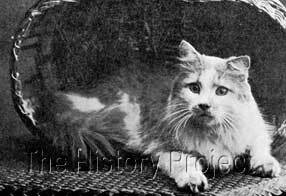 So a very great emphasis for a number of decades in fact, remained on the refinement of self-coloured cats and this moved also into the silvers, which suffered to large degree by variation of shading and barring, and few if any breeders, were seriously interested in the refinements associated with breeding a bi-colour and to ensure that by selection, they were correctly marked. As a result, no-one of consequence appears to have entertained the idea of retaining a bi-colour male for breeding. The very pragmatic American fanciers opened up the classes so that Bi-colours competed with like colours. Although styled upon the English system, the officers of the early American Cat Clubs, were more open to providing a separation of classes at shows, where multiple exhibits of a rarer colour might be entered. A classic example of this approach was that the American clubs were the first to separate the extremely popular White Longhairs into individual classes based upon eye colour. An Orange-eyed White would no longer compete directly with a Blue-eyed White or an Odd-eyed white, until they had gained a first in the class for their own eye colour, and so on. Likewise, the very pragmatic American fanciers opened up the classes for Bi-colours, so that Blacks with white competed firstly with other blacks with white and unlike in the English shows, where Black and Whites, Blue and Whites, Tabby and Whites etc. were invariably thrown together into one large A.O.C. (Any Other Colour) Class. Two Bi-colour Longhairs shown in the United States in the late nineteenth century. 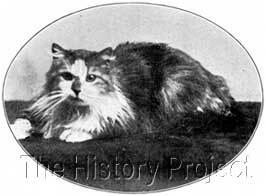 It was Mrs. W. Eames Colburn of the 'Brushwood' Cattery, (well known for her Whites) and Mrs. Oella T. Blake of 'Spangle' Cattery that formed an alliance to import a Tortie and White Longhair. Mrs. Colburn was already in the processes of importing her famous black male 'BLACKTHORN' direct from Aleppo (in what is now modern day Northern Syria). Her contact in the region was the U.S. Consul, William C. Magelssen. There is every reason to believe that an opportunity arose to bring in a Tortie and White cat at the same time, and the cost would conceivably have been significant. But whatever the reason, Mrs. Colburn and Mrs. Blake jointly acquired 'Spangle' and she duly arrived in the United States, direct from the Middle East, very likely along with 'Black Thorn'. Of course, how she came about to be called 'Spangle' is a mystery, but suffice to say, that with Mrs. Blakes Cattery name also being Spangle, she ended up with the somewhat incongruous appellation of 'Spangle Spangle' and was just affectionately referred to by her singular 'proper' name. A period photograph, showing the random nature of markings when breeding bi-colours. Photo: C.E.Bullard, 1902. 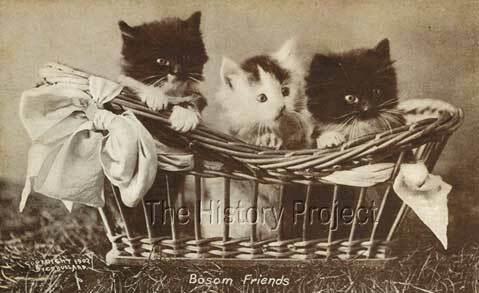 An M.T.Sheahan 'Cute Kitty' Series Postcard. Spangle was shown in 1903 at Chicago, where she won a 1st and a Special. 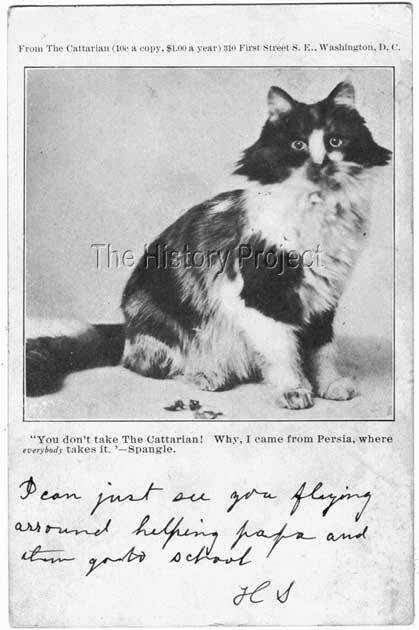 We do not have an exact date of birth for 'Spangle' but a supposition has been made that in order for her to have been sourced, and of an age to travel safely and then be successfully bred and produce a litter in July of 1902, she is likely to have been at least in her second year of life by the time the litter this litter was born. This would put her own date of birth as circa 1901. 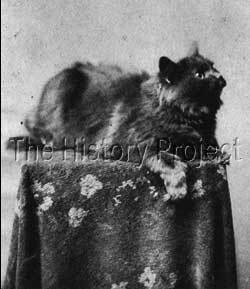 Her date of birth in the Register of the Beresford Cat Club (BCC 637), is listed as June, 1901. The following year, both 'Spangle' and her daughter 'Thorne Rose' were bred to 'Ravenswood Hamish', a lovely Orange male, who was acquiring quite a name for himself. 'Hamish' was owned by Mrs. F.W. Story, who also lived in Chicago, so neither female would have had to travel far to stud. 'Spangle' was probably one of the prettiest imports to come from Western Asia, direct to the United States. But although she was carefully and selectively bred to the choicest solid males available, both from her own region and from the best of English and American lines, the lack of a quality Bi-Colour male to breed her to resulted in her producing mostly solid-coloured progeny. Nevertheless, her wonderful patching of Black, Red and White must have been a thrill to see, and would have shown her owners, that bright and cheerful colours were indeed achievable and something to attain to.